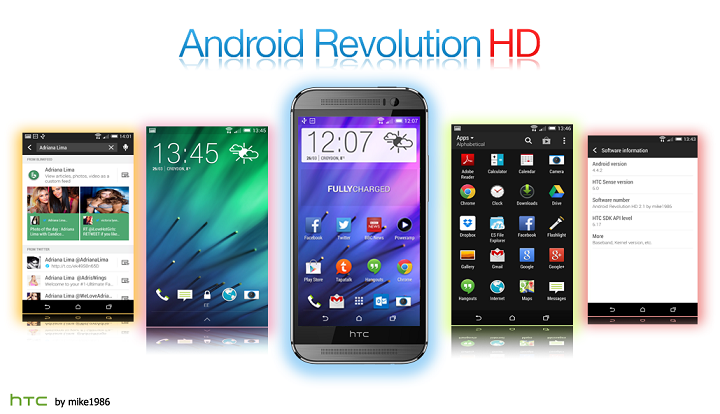 One of the most popular custom ROMs that is available for various Android devices is the Android Revolution HD ROM. If you’re looking for a ROM that is stable, fast, smooth, maintains a look close to stock and provides great support, then this ROM is probably the right choice. It is based on the Android 4.4.4 KitKat firmware and is basically an improved version of the stock HTC One M8 ROM. The ROM comes with HTC Sense 6.0, RAM optimizations, various tweaks, speed optimizations and OpenVPN support. You’ll need root access on your HTC One M8 before installing any of the ROMs mentioned below. In order to find out more on rooting, feel free to read our guide. Installing custom ROMs is quite risky and it will void your warranty. Charge your HTC One M8 at least 70%. Make sure that you install the ROM that is available for your HTC One M8 variant. If you install a ROM that is for another variant, then you might brick your phone. Backup all the files on your phone as everything will be deleted. You can read our list of the ten best backup apps for Android. Follow all the instructions from the developer properly. You’ll find the developer specific instructions on the XDA thread of the ROM that you’re installing. Make sure you read all the instructions as you might brick your HTC One M8 if the instructions are not properly followed.